I'm thrilled to announce a new book coming out in June. As you may know, I make my living on the road, teaching the Toyota Way. An odd life, perhaps, but one I’ve chosen and very much enjoy. To help make sense of all I've seen and experienced these past twelve years, I've kept a journal. Hundreds of pieces written in airports, restaurants, and hotel bars. Leafing through my notes these past few years, I realized there might be a book here. So I polished and organized the best pieces. What's Reflections of a Business Nomad about? 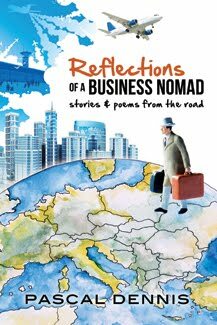 It's a book of stories reflecting the exotic, exhilarating, and sometimes poignant, world of international consulting. Leadership & ethics is a core theme: people in tough situations, doing the right (& wrong) things. The book is a departure. Up until now, my books have been prescriptive: "Here's how you do X..."
For example, here's how you transform a struggling auto plant -- (Andy & Me). Or, here's how you transform an entire auto platform -- (The Remedy). Reflections, by contrast, is a decidedly non-prescriptive book. As always, I ask plenty of questions, but leave the answers to the reader.